My goal today was to complete a woven artist trading card, and I achieved that goal! Well, almost. I have to put a backing on it, but I think that I’m going to wait until I get about half a dozen woven and back all of them at the same time. 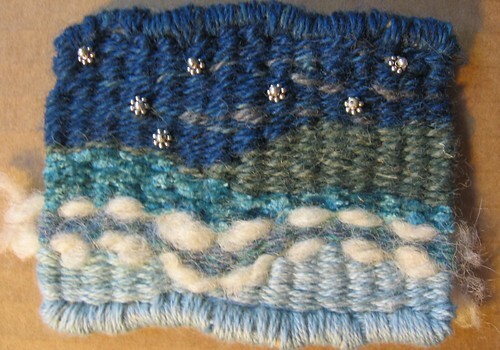 Earlier this month, I wove two other little tapestries which I meant to be artist trading cards, but the size was not quite right. The only two restrictions for an artist trading card is that it can’t be sold and it must be 2 1/2 by 3 1/2 inches. Think baseball card. So those two will be pins. When I hit the size right, it will be an ATC, and when I don’t, it will be a pin. The theme of Art & Soul is “By the Sea.” From what I understand, most of the attendees carry with them lots of little handcrafted goodies to trade. 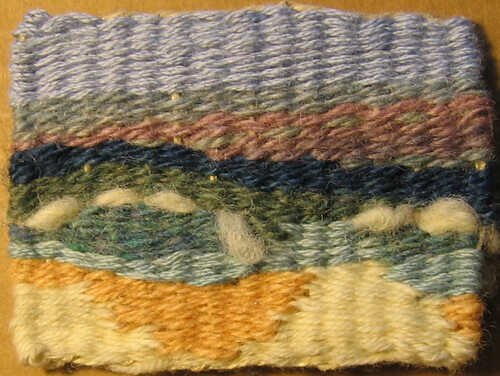 I’m weaving these tapesties on little cardboard squares, and they are doing double duty – they will be trades and they are studies for my next tapestry bag. 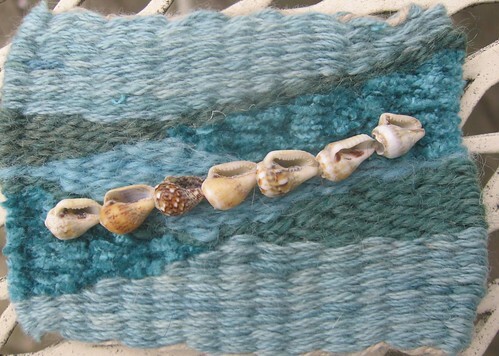 Weaving these little tapestries is one of the most relaxing things I’ve done for a long time, and it is so easy. Taking photos of the little weavings, not!!!!! Also, I planned to do a lot of beading on my collages and art quilts and fabric journals and weavings. I might need to get my bifocals first – it is definitely ten times harder than it used to be to thread a needle and poke it through those tiny little holes. So, to recap, weaving = fun! Photography and beading = frustration.